Megalania was like a giant Komodo dragon, a huge monitor lizard, up to 5.5 metres (18 feet) long. Some estimates have been up to 7 plus metres (26 feet) That makes it the biggest venomous animal ever. Megalania was the biggest of the monitors. In Australia, the goanna is one of its little relatives, and it's usually the size of a border collie, when full grown, although a known living relative of Megalania, the Perente, is somewhat bigger. The Komodo Dragon is a sort of quarter size version. If you check out these images, you get the impression of a monster lizard, but this thing was the size of a horse. The skull of an adult alone was the size of a human, according to some texts. A new study has shown that the effectiveness of the Komodo Dragon bite is a combination of highly specialized serrated teeth and venom. The authors also dismiss the widely accepted theory that prey die from septicemia caused by toxic bacteria living in the dragon's mouth. All reptiles have some very dangerous bacteria in their mouths. That’s been considered, as you can see, to be their secret weapon. There’s another side, however, to the dragons. Their teeth are like steak knives, and they can do a lot of damage with their bite. Australia’s goannas are relatively harmless, mild tempered, and don’t attack things bigger than themselves. The Komodo Dragons, however, are fierce, and they can even kill tough animals like wild pigs, and people. The Komodo Dragon is the nearest thing to Megalania, a direct descendant. They’re top predators. They use an anticoagulant to cause massive bleeding by their prey, which is really overkill. They’re powerful animals, and the bite would take out most animals from loss of blood anyway. However, it’s also good strategy. The “bite and flight” approach is also believed to have been used by animals like Tyrannosaurus Rex; one huge bite, and the animal is already dead. If it tries to run, it bleeds to death. If it tries to fight, it gets progressively weaker for the same reason, expending energy as well. There’s another twist with Megalania, though: The bite induces paralysis as well. An immobilized prey, which can’t fight and can’t run. Loss of blood also causes shock, another immobilizing effect. This highly complex venom combination is a good strategy for any animal in an environment like Megalania’s Australia. The marsupials were at their height in that time. The marsupial lions, the Tasmanian tiger, (Check out the video of the last Tasmanian Tiger. You can see why people keep wanting to bring it back, even if it still couldn’t be introduced onto the mainland with the Super Dog packs. )and the giant kangaroos were the big animals. Big saltwater crocs were rampant. A monster wombat, the size of a hippo, called Diprotodon was the main prey. So a quick kill approach would have been a very good idea, both dealing with big dangerous prey and knocking it out before having to deal with big dangerous competition, particularly other Megalania. There’s another ramification or so to this story. Megalania's exact role in the ecology is quite unclear. There just haven't been any major reptile land predators in this ecological niche, anywhere else on Earth. There's obviously a lot to be learned. On Komodo, they're the dominant predator, because there's no competition. In ancient Australia, there obviously was competition. Komodo Dragons are also scavengers, believed to pick up a lot of their toxicity from their food, necrotic bacteria in the carcasses. Megalania, however, is so far believed to have been an active predator, although scavenging like the Komodo Dragons is a common behavior among predators, even among lions. So where was Megalania, on the ecological scale? Super predator, or one of a range of predators, like in Africa? Komodo Dragons aren't even afraid of humans, let alone other predators. They don't need to be. They're big, venomous, and aggressive. Marsupial lions and tigers were big, but not stupid enough to take on a lizard bigger than themselves. If they behaved like Komodo Dragons, they should have been on top of the food chain, but that's not really clear from findings so far. The Aboriginals, and the dingoes, are widely believed to have totally changed Australia’s ecology. The dingoes did have a huge impact, being far superior as true dogs and as pack hunters, and ruthless with other predators. Apparently, though, although the Aboriginals did change the landscape, with their hunting and burning, they didn’t really have as much impact on the mega marsupials as originally thought. The giant marsupials were already on the way out. If you check the link to the giant kangaroos above, you'll see that a massive drought destroyed them, which would have crashed a major part of the food chain, decimated their predators, and systematically brought down the old fauna as new competitors moved in. 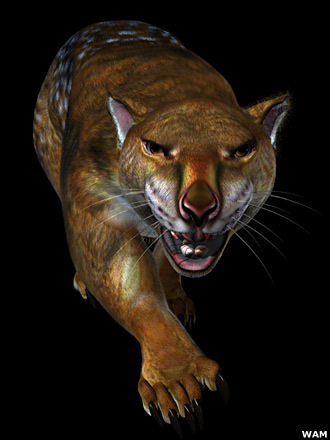 That would have affected Megalania, as a land predator, removing the big prey and leaving them trying to catch much faster, tough and agile animals like modern kangaroos, and having to deal with dog packs, if they lasted long enough to encounter the dingoes. Juvenile Megalania would have been no match for dog packs. The question remains, did Megalania die out, or was it pushed over the edge? There's an obvious possibility, but that question hasn't been answered authoritatively yet, either. One thing about Australia: "A traveler in an antique land" gets his mind blown, regularly.